When an exhibition of photographs and artefacts bears the title 'Story of a Nation: Independent, Occupied and Exiled Tibet', one wonders: how few photos can take up such a great task of telling the story of a nation better, when volumes have already been written! Yet, photos indeed speak better than words; especially when the artist whose works form part of the 'Story of a Nation', is one amongst these eminent, world renowned photographers! The participating works in the exhibition include those of Angel Lopez Soto (Spain), Angus McDonald (Australia), Brian Harris (Canada), Diane Barker (UK), Jaqueline Meier (Switzerland), Giulia Francesca Johnson (USA), Lobsang Wangyal (Tibet), Kathryn Culley (USA), Manuela Metelli (Italy), Ken Damy (Italy), Nancy Jo Johnson (USA), Prabir Purkayastha (India), Prabuddha Dasgupta (India), Sonam Zoksang (USA), Suresh Natarajan (India), Vijay Kranti (India), Vikas Khot (India), T Wachs (USA) and William Chapman (USA). Volume after volumes written on Bhopal Tragedy will not equal the impact of The half-buried child, photograph taken by Raghu Rai. This is the case with each of the photographs. These photos depict the phases of Tibet – its past glory, the tribulations of its peace-loving people when subjugated by its neighbour, the struggle underwent by the people for freedom, the sacrifices made by its children, and so on. Walking along the exhibition hall, one can see how history speaks for itself about this once free sovereign nation. Prominent among the antiques and artefacts is the passport issued by the Tibetan government in its glorious past. However hard they try, however loud they shout that Tibet had always been a part of China, these historical evidences can't be negated and evidences of a free nation can't be obviated. Tibet was a free country! To honour the sacrifice and pain undergone by the photographers to depict the real face of Tibet, Friends of Tibet came out with 'Story of a Nation', an exhibition scripted by Jane Perkins and Lhasang Tsering. The script talks about the three phases of the nation – Independent Tibet, Occupied Tibet and Tibet in Exile. The original passport of Tsepon Shakabpa recovered in 2004, by Friends of Tibet, is an important evidence to prove that Tibet was a Free Nation. The 1934 edition of National Geographic Magazine, special edition on Flags of the Nation showcased the Tibet flag confirming Tibet's independence. The currencies used in Tibet between 1919 and 1954 were also displayed. Original military uniform of the People's Liberation Army (PLA) along with Mao's Little Red Book was a stark reminder of the Red Dragon's invasion of the peaceful country. 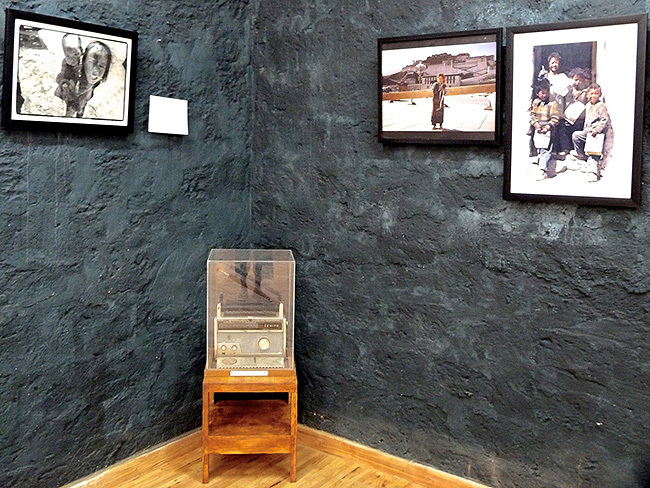 The Zenith Radio used in Lhasa, Tibet and in exile in India by His Holiness the XIV Dalai Lama, sat in a corner reminding and exhorting the message of Free Tibet. The photographs were a silent reminder about the destruction of over 6000 monasteries, confiscation of art treasures and other valuables, and conversion of rich heritage to rubbles, a holy city now turned to a brash business boomtown. Photographs by Manuela Metelli portrays the malnutrition and lowest life expectancy now rampant in Occupied Tibet; 67 percent of children diagnosed with clinical rickets. Tenzin Tsundue, Tibetan poet-activist and General Secretary; Sethu Das, Founder of Friends of Tibet; and Eswar Anandan, Campaigner of Friends of Tibet speak to the gathering on February 11, 2015 at the Centre for Social & Political Art (CSPA), Alappuzha, Kerala. Tibet is developing, but to whose long-term benefit?! Tibet's rich water resource, oil and gas reserve is being diverted to China through mammoth multi-billion dollar schemes. Photographs by Sonam Zoksang and Kathryn Culley provides an insight on Tibet's so called development. Lobsang Wangyal captured the peaceful candle light procession in Lhasa. The Eleventh Panchen Lama, recognized by Dalai Lama, mysteriously disappeared. Every year on his birthday, Candle light procession and prayers for his wellbeing is held in Exile. The host at Sylviander House Ms Sylvie Alexander and Alexander Devassia gave a formal welcome to all the guests assembled. Tenzin Tsundue, the Tibetan poet-activist supplemented the exhibition with the narration about what the Tibet Issue is. He shared his optimism of restoring freedom to Tibet even if its becoming seemingly impossible. Stressing mainly on non-violence as the guiding principle, he drew parallels between Indian Freedom movement and Tibetan struggle. He said that what was possible in Indian Independence struggle is equally plausible in Tibetan struggle. He went on to add that the goal is far more difficult in this age, than it was during Indian Independence movement. "It has to be so, when market forces align with imperialist/ dictatorial forces, where ethics and truth are not paramount, and which is more obvious now than it was earlier. Yet a free Tibet is all the more important to India given the tactical role a free Tibet can play in India's security. When Tibet's natural resources are subjected to mindless and relentless exploitation affecting the very balance of the already fragile ecology of the region, it is the moral duty of the whole world to side with Tibet for its freedom", Tsundue exhorted. Story of a Nation is the inaugural exhibition of CSPA (Centre for Social and Political Art) and the inaugural ceremony was a unique event. 20 Tibet supporters and well-wishers of Friends of Tibet inaugurated the event by lighting the Traditional Tibetan Butter Lamps, and the environs was instantly enveloped in peace and tranquillity. The 20 lamps were lit by 1) Dr Shri Dorjee Rapten Neshar, Chief Medical Officer, Men-Tsee-Khang, Bangalore; 2) Shri Tenzin Tsundue, Tibetan Poet-Activist 3) Shri CJ Yesudasan, Political Cartoonist 4) Fr Shri Nelson 5) Fr Shri Rimson 6) Shri Ravi Palathinkal, Gandhian Activist; 7) Shri Viswambaran; 8) Shri Francis Kodankandath, Artist and Customs Official; 9) Shri Mathewkutty J Mattom, designer and photographer; 10) Dr Madhavachandran V, Director, Nagarjuna Ayurveda; 11) Shri TS Anandan; 12) Shri L Manjunath of Bhima Group 13) Shri Kailashnath of Bhima Group 14) Shri Rajan Menon, Retired Scientist, BARC; 15) Smt. Victoria Sheldon, Friends of Tibet Volunteer from Canada; 16) Smt Sylvie Bantle, Co-founder, Centre for Social & Political Art (CSPA); 17) Shri Alexander Devasia, Co-founder, Centre for Social & Political Art (CSPA); 18) Shri Suku Dass, Friends of Tibet Campaigner and Co-founder, Centre for Social & Political Art (CSPA) 19) Shri Yeldtho Mathew, Friends of Tibet Campaigner and 20) CA Kallianpur, National Coordinator, Friends of Tibet. Dr Shri Dorjee Rapten Neshar, Chief Medical Officer, Men-Tsee-Khang, Bangalore, honoured the special guests by presenting them with the Tibetan white silk scarf called 'Katha'. While presenting the Katha, Dr Dorjee mentioned that the white colour of Katha signifies purity of heart and that the eight auspicious symbols on the scarf are meant to be lucky for the individual to protect him from negative energy. Tibetan medical system is known as Men-Tsee-Khang. Dr Dorjee explained the meaning as: Men = Medicine, Tsee = Astrology and Khang = Institution. Dr Dorjee briefly mentioned about the evolution of Men-Tsee-Khang in India: from a humble single room set up to a huge institution having 66 clinics spread all over India and Nepal. Dr Dorjee further shared the basic tenet of Tibetan healing system: Illness occurs when there is imbalance in the mind-body relation. To keep up the balance, one has to be careful about the diet and should adopt proper life style. All ancient, especially oriental systems, follow this approach. Rather than relying blindly on the numbers denoting the health parameters as per allopathic system, Tibetan healing system, like all other ancient and traditional systems advise us to listen to the body and mind.